The past few months I’ve been trying to tick off as many Eldorado Canyon climbs as I can off my todo list, especially ones that are close to my climbing grade limit. There is a lifetime of climbing near Boulder and it seemed like I was repeating routes that I had done before. My friend Jonny has been instrumental in helping me tick off most of these climbs, always ready to charge up something on the weekend or after work. Having a psyched partner always helps! The above photos are of Jonny on Alice in Bucketland and Hair City. We linked up Rosy Crucifixion to Alice early one Saturday morning while the canyon was virtually empty of climbers. It was a bit surreal to be climbing all alone on the popular Redgarden Wall, but we descended into familiar territory after we rappelled back down into the growing crowds. Jonny again on Northcutt Start and pitch 1 of Break on Through and Jeff on the super-cool route Positively Fourth Street. I lead the second pitch of Break on Through and puzzled for a few minutes at the crux before finally just trying the moves and pulling through it. I think it is physically impossible to do this climb without singing the Doors song. I apologize to anyone who was in the general vicinity while I was topping out. Matt on Mesca-Line, Fabio on the third pitch of Long John Wall and Scott climbing White Lightning. Mesca-Line has to be one of my favorite 5.7s in the canyon because you can climb the whole route with just a rack of nuts. Long John Wall has to be the best 5.8 route in the whole canyon, a must do if you are in the area and a great mid-winter climb because of the southwest aspect. Jonny again on Xanadu, Scott on Purple Haze and me on Chockstone. Xanadu was an awesome climb although a bit runout at the start. Chockstone is a great intro to 5.10 in Eldo since the crux section is pretty short and fairly well protected if you have a decent reach. The crux move is protected by a good nut overhead and the difficulties subside when it is around your knees (as seen below). April and May saw the end of our winter here in Colorado, but before it left I had to get out and take advantage of the remaining ice and snow. Monika and I had the opportunity to get out for a Saturday and head up to Lincoln Falls for her first time ice climbing. We ended up climbing three pitches of ice and topped out on a mild spring day with a few flurries and nearby wet slide avalanches on steeper aspects! It was a superb end of the ice season and I think Monika is hooked. The end of the ice season typically signifies the start of the couloir season. The temperatures had been very mild while still freezing at night when Micah and I set out to climb Dragon’s Tail Couloir in Rocky Mountain National Park. The climb was a nice and easy slog, punctuated by a few reminders to start out earlier next time. Back at the car at 10am, we finished up the day by having breakfast in Estes Park and then doing some rock climbing at Lumpy Ridge. You can’t beat climbing snow in the morning and finishing up the day in a t-shirt! A few weeks ago I took a short trip down to the Ouray Ice Park in Ouray, CO for a long weekend of ice climbing in the most accessible ice climbing venue in Colorado. The ice park is just a few blocks away from most of the hotels in Ouray, making it a short 10 minute hike to almost anywhere in the park from your room. Friday we arrived in town, had some screws sharpened at Ouray Mountain Sports and then checked out conditions by hiking up Camp Bird Road. Saturday found us in South Park, toproping a few pure ice pillars and one mixed crack that was super fun. Sunday morning we woke up early to climb Pick o’ the Vic, a 140′ WI4 ice climb that Will Gadd climbed for 24 hours straight for the Endless Ascent charity event. We also headed into the Scottish Gully area to climb an interesting pillar called Popsicle that formed up pretty fat this year. I was able to take some pictures and a video of the climb from across the gorge before we had to leave for home. Short trip but getting about 10-12 laps in the park in a weekend made it worth the long drive. Embedded Facebook video below, I also posted the video to Vimeo. November was the perfect time to head down to the desert for a little bit of climbing. It was my first time to The Creek and I had a great time exploring the area with a few friends and getting a little schooled on crack climbing. I’m not new to crack climbing but these climbs were sustained. It was a blast and I can’t wait to head down again for some more sweet, sweet crack. Climbing, crack climbing. Before I left I seemed to have misplaced my trusty old Canon SD400 point and shoot camera. I typically take this camera with me when I am climbing because it is compact and reliable. After searching around the house for a month I decided it was time to buy a new one. I ended up choosing a Samsung HZ15W for the nice lens (24mm wide with 10x zoom) and simple features including manual settings for shooting panoramas. So far I’m happy with the camera, I think it takes good shots and I am especially happy with the wide-angle lens. When climbing I think the lens will let me capture much more of the climb than I was able to with the standard 28mm lens of my old point and shoot. The camera is a little bit bulkier but the only complaint I have so far is the noise when shooting video and using the zoom lens. The video quality is great (720p) but having the microphone mounted on the camera lets it pick up the lens noise. I tested out the camera last weekend when my uncle Garth came to visit us in Colorado. He hadn’t been to the Moab area of Utah, so we took a quick weekend trip to camp and do a bit of hiking. We drove down through Castle Valley just outside of Moab and then camped at Beef Basin in Indian Creek. The next day we did a hike in Canyonlands National Park to the Druid Arch rock formation. Twelve miles later we were back at the car and in the morning headed back to Colorado. Uncle Garth liked it so much he drove back to Moab the next day to visit Arches National Park. Longs Peak. The Diamond. These geographical features are well known to almost every Colorado resident, and especially to each rock climber that lives in the area. The moment I laid eyes on the Diamond during an early visit to the area, it became one of my goals to climb it. At the time, the easiest route up the face was far beyond my abilities, but it went on my MountainProject todo list anyway. Trips up the Flying Dutchman and Martha snow routes only reinforced my desire to make it up the Diamond someday. 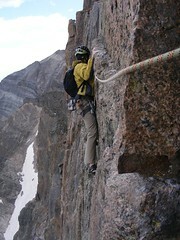 My buddy Jon and I had talked about doing the Casual Route, the easiest route up the Diamond at 5.10a for a few months. This past week we committed to tackling the climb at the earliest weather window, preferably mid-week to avoid the higher than normal climber traffic this route has been seeing this season. The forecast seemed to clear for September 2nd, a Wednesday with only a 10% chance of isolated thunderstorms – about as good of a forecast as you can get in that area. We pre-selected the rack and agreed to meet up at 1am in Lyons for the drive to the trailhead. Alpine starts always come sooner than you expect, especially when a bit of anxiety about the forthcoming climb exists. I woke up five minutes before the alarm went off, turned off the alarm and stumbled downstairs to make my coffee and pile into my pre-packed car. I met Jon at a parking lot in Lyons, arriving one minute before he pulled in behind me. Loading the gear into his Jeep, we drove up through the foothills for another 45 minutes to the Longs Peak Trailhead. Double checking our gear and shouldering our packs, we signed in to the trailhead register noting that another party had already signed in that day with intentions of climbing the same route. They had signed in at 12:30am, and we were over an hour behind them at this point. Hoping we would not get in each other’s way, we started up the trail and tried to keep a steady pace. Alpine approaches are always the same. Dark, sleep-deprived and tedious, with your world narrowed down to whatever your headlamp illuminates on the way to your climb. No distractions, just one foot after the other while known landmarks and trail signs pass you by, your thoughts on the climb and descent that is far ahead of you. We quickly passed one party headed for the Keyhole route, immediately identifiable as hikers because of the gear they were carrying. At treeline we spotted another set of lights up ahead, quickly caught up with them and discovered they were the other party headed for the Diamond. We chatted with them for a minute and continued up the trail to Chasm Lake, relieved that we would be the first party up the North Chimney – a 550 foot gully that splits the lower Diamond face. 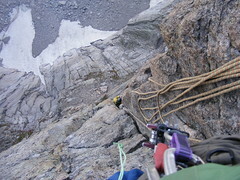 The North Chimney serves as the approach to the Casual Route and is notoriously loose and chossy. It was still dark by the time we arrived at Mills Glacier, a thin ribbon of snow and ice that stood between us and the start of the North Chimney. We racked up, buried our packs under large rocks to deter marmots from snacking on the packs or their contents, silently thanked whoever had installed a fixed rope across the snowfield and prusiked up the line to the start of the route. We simulclimbed most of the North Chimney, occasionally stopping and belaying through tricky sections that were steep or loose (or both). Finally we stood atop the D1 pillar, a feature on the route where the difficulty begins and the climbing turns vertical. Dead vertical. It was now my lead, and looking up at the crack and traverse ahead of me made me feel dizzy. I felt like throwing up, due to the altitude, nervousness or both. This was the highest, longest and most difficult climb I had ever done. Unlike other climbs, I wasn’t sure of our success. I racked the gear, took a drink of water, fiddled with the rack a bit more and finally unclipped myself from the anchor and moved onto the route. As I moved from handjam to fingerlock, placing gear and getting into the rhythm of the climb I began to feel better. Fourty feet from the belay I began to traverse left, finally feeling solid and in control. I arrived at a belay stance and Jon followed the pitch, collected the gear from me and lead the next section up to the base of the enduro corner pitch. The middle of the Casual Route ascends a 200 foot right-facing corner system that is vertical, clean and sustained through the entire length. I headed up the corner, feeling much better than my first lead and comfortably running it out between pieces of protection to conserve my gear for the whole pitch. This is hands-down the best pitch of climbing I’ve ever done anywhere. I could not help but smile and sing to myself the whole way up, even though at this point I was feeling the effects of the altitude on my strength and breathing. The pitch tops out on the most comfortable belay ledge of the whole climb, allowing me to take off my shoes and the pack and relax while Jon followed the superb corner. I led the next 40 foot section up to the Yellow Wall Bivy ledge while Jon caught his breath at the comfy belay. The crux pitch was next and we both wanted Jon to be fresh for the varied but sustained difficulties. Jon arrived at the ledge, racked the gear and took one more look at the topo before heading out. Steadily I payed out rope to Jon as he moved higher and higher from the belay, always vigilant to not let him have too much slack in case of a fall. As the rope passed the middle mark, I knew he must be very close to the top of the pitch. At last, I heard a whoop, and Jon called “off belay”. I followed the pitch clean, trailing the pack through a squeeze chimney that barely gave me enough room to turn my helmeted head inside it. I arrived at the crux panting from the effort and altitude, and rested for a second before tackling the hardest part of the climb. Pulling through the crux, I stood on a tiny ledge, over 1000 feet above the talus. We were excited. The hardest part of the climb was behind us and it was literally all downhill from there. I congratulated Jon on a stellar lead but we saved most of the celebration for after we were down off the climb. I led out across the Table Ledge traverse and found the rappel anchors that would allow us to descend back down to our packs. Jon followed the pitch and we happily began the process of organizing the gear and ropes for the nine rappels to Mills Glacier. The first rappel went smooth, and I paused midway to take some photos of climbers on Pervertical Sanctuary. 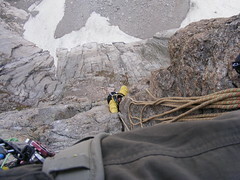 On the third rappel, I descended to the ends of the ropes without finding the next rappel station. I prusiked up and swung around, trying to find where the bolts were located. We saw from the topo that the bolts were around a corner, but I couldn’t see them and we were holding back the party from Pervertical who were now rappelling down the same route we were. I built an anchor, clipped into it and yelled up to Jon that I couldn’t find the rappel station and he would have to find it on the way down. Jon located the station with help from the other climbers, and we let them pass us so we could follow them down the rest of the way. I was wrestling with a Camalot C3 that had become stuck at my stance due to a kinked/faulty trigger wire when the other climbers rappeled down past me. “Hey man, are you doing alright?”, the lead climber asked me. I replied that I was just working out the C3 with my nut tool because the trigger wasn’t working when I finally recognized who I was talking to. “Are you Kelly Cordes?”, I asked him. 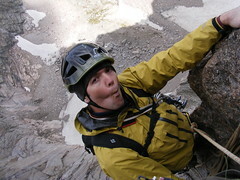 Kelly is the senior editor of the American Alpine Journal and a Patagonia ambassador. Kelly was very helpful to Jon and I while we made our way down the rest of the route, and probably saved us a half hour or more on our descent. We finally arrived back at our packs, sliding down a bit of the snowfield after the last rappel with only a nut tool to self-arrest with. I experienced the relief that only a climber can understand - taking off my climbing shoes at the end of a long day and changing back into my approach shoes for the descent. We began the talus-hopping back down to the lake, looking back every few minutes at the Diamond.